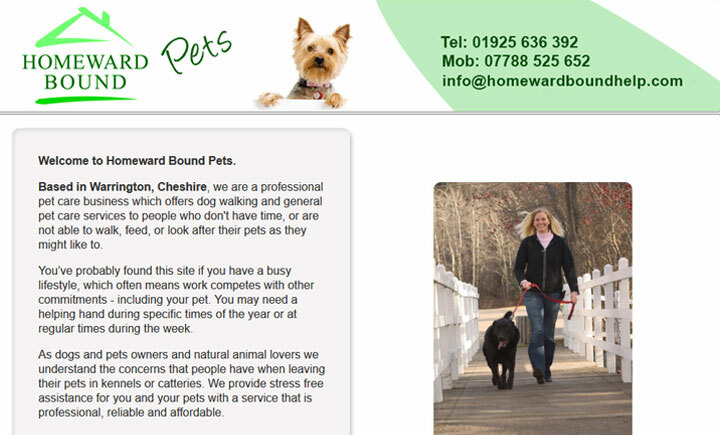 Homeward Bound Pets are based in Warrington, Cheshire and are a professional pet care business offering dog walking and dog sitting services to local dog owners. We understand the concerns that people have when leaving their pets in boarding kennels or catteries. We provide stress free assistance for you and your pets with a service that is professional, reliable and affordable. We are insured, CRB checked and have a professional attitude, so you can be assured your pets will be properly cared for. Homeward Bound Pets also covers Thelwall, Grappenhall, Appleton, Stockton Heath, Hatton, High Legh, Appleton Thorn, Dudlow Green.